Guard-Nut® SHEAR-TYPE™ fasteners insure precise torque control, and no-fault quality assurance. This cuts inspection time and insures specified clamp loads. Unique Double Hex design with proprietary HEX-GUARD™, the plastic insert that permits torquing of drive head only. The Double Hex feature permits easy removal and re-use as a conventional fastener after drive head has been sheared off. (Also available in single hex design without HEX-GUARD™ for more permanent, economical installations. Guard-Nut’s specially engineered 360 degree prevailing torque locking thread design enables accurate and repeatable locking torque. All torque limiting fasteners available with left hand threads. 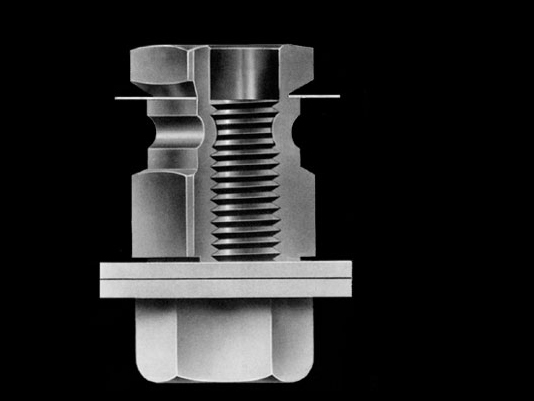 All Guard-Nut® SHEAR-TYPE™ fasteners are available in screw and bolt type configuration. No limitation on bolt length. Torque limiting feature-head shears off at predetermined level. 360 degree prevailing torque locking design. Conventional Hex head to ISO standards. No special tools required. HEX-GUARD™ insures torqueing of drive head only. Clean, even break. No sharp edges. Optimum bearing surface permits maximum torque values and clamp loads. SHEAR-TYPE™ Multi-Purpose Fastener—Vibration resistance and torque control—all in one fastener. Copyright © 2019 Guard-Nut Inc. All rights reserved.